Fungus Hill is a relatively new band from Umeå in Northern Sweden. They began playing together in 2015, recording an EP, two singles, and a music video. 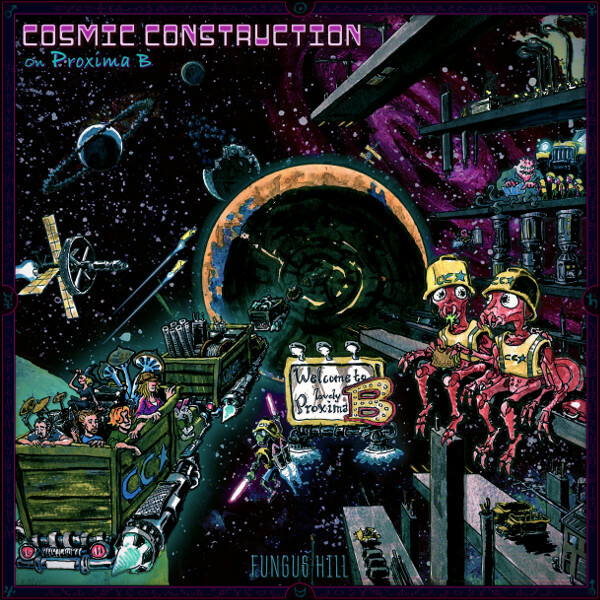 Then in 2017 they released their first full-length album, Cosmic Construction on Proxima B, a space opera mixing psychedelic jams, stoner rock, and progressive rock. To record their album, the band sequestered themselves in a remote cabin for two weeks along with their instruments and recording equipment. To help them capture the feel of classic psychedelic and progressive rock, they recorded all tracks “live” with harmonies and overdubs using a variety of instruments to create a fuller sound. Their goal was to create a listening experience to tell the adventurous story of Proxima B, rather than a set of independent tunes. I think that band members Erik Sköld (guitar), Nils Mörtzell (drums), Gustav Orvefors (guitar and vocals), Tom Westerlund (bass), and Jenny Isaksson (vocals and percussion) pulled it off. The opening track, “Year 2199,” has a dark mechanical, industrial sound with a processed vocal narration about a post-apocalyptic Earth with the population having lived underground, now preparing to leave to leave the planet, and travel to Proxima B to colonize a new world. Then Fungus Hill proceeds to take you on the “Voyage to Proxima B” with their slow blend of trippy psych / prog / hard rock and a nod to Jimi Hendrix’ “Third Rock from the Sun.” Along the way they encounter some “Space Witches” and melodic lines that build to an all-out distorted psych jam. Then we have “Year cb3 XIII,” a reckoning of the length of the journey, filled with demonic laughter and mournful moaning instrumentation. Soon the closeness of everyone in this tin can in space leads to a “Psychoactive Atmosphere” where the band kicks into a hard UK trippy neo-psych jam followed by the resulting insanity of the “Dandelion Mind” that starts with an unplugged performance of acoustic guitar and vocals, morphing to a blistering jazzy psych jam that climaxes in lysergic bliss. The journey is taking so long now that the passengers begin thinking of the trip as “My Delusion,” probably the best track on the album and another psych excursion into the cosmos. And these mind expanding experiences become introspective with the stoner psych jam “Universe inside My Head.” The ship finally reaches Proxima B and the passengers realize that their destination is a “Desert of LIfe,” another stoner rock number with a 12345 note sequence and soaring vocals. The album closes as a retrospective of their arrival on Proxima B, “Year One,” a slow ambient intro to a strong gothic western vibe. I don’t know what else to say, but if you are a fan of 60s / 70s psych rock jams mixed in with stoner rock, you will love this new album.